Segment A of Basketball in The Family featured the following "Basketball Families": Carol Severin-Abraham and son; Junior Alcid and son; and Derek Alexander and son. Levi has been playing League Basketball for over 25 years now and during that time he has been on five teams: Pacers (from Pichelin), Raiders (Portsmouth), Clouds I (Goodwill), No Look (Roseau), and Ole Skool (Roseau) where he is still currently a regular top-scorer. Levi, a.k.a. "Bumping", currently also coaches Falcons in the Premier Division of the National League. He was featured in an exclusive, full-length Jump Ball article entitled, "Levi 'Bumping' Baron: Still Full of Energy" which was published in The Sun on 12th December 2016. Levi's son, Kohath, plays with St. Mary's Academy in the Sports Division Under-19 Schools Basketball League, and represented Dominica in the basketball segment of the 2017 Windward Islands Schools Games. Kohath, who is also a "very serious" young cyclist, also plays with Falcons in the National Under-17 League which was inaugurated in 2017. As a young teenager Kohath sometimes plays with his father at Pichelin, and has actually received some coaching from the "old man". "Dr. Rats", as Derrick is popularly known, has four of his children and his common law wife, who were involved or who recently got involved in basketball. He played for more than twenty years in the National League, but only for four teams. Dr. Rats entered the League in 1982 playing with Lambs Bread in Division II. One year later he was drafted to the legendary Cardinals, with whom he played for an aggregate of about 18 years. He left Cardinals and went to play with J.K. Killer Bees for two years, then with Clouds I for one year. He subsequently returned to Cardinals and remained with them until he and the team retired from the sport in 2004. Importantly, Dr. Rats was a member of the Cardinals team which represented Dominica in the OECS Champion-of-Champion Clubs Tournaments here and overseas, and in the Caribbean Basketball Clubs Championships held in St. Lucia and Grenada. At the national level, he represented Dominica in the Windward Islands and OECS Basketball Tournaments. Ahlai-Anna, Dr. Rat's second daughter, played competitive basketball for only one year, with Convent High School in the Sports Division Girls Basketball League. She also represented Dominica in the Windward Islands Inter-Schools Games in 2012. Kirby, Dr. Rat's eldest son and his stunning look-alike, was a founding member of CrossOver; at the time that team played in the 3rd level Men's Division (Division II) of the National League. He only played in 2011. Tilon, the 2nd son of Dr. Rat's, has played competitive basketball with five teams thus far. He debuted with St. Mary's Academy, then played with Clifton Dupigny Community College in the Sports Division Under-19 Boys Basketball League. His next teams were Spartans United Ballerz followed by Trafalgar Green Hornets. Currently he plays with X-Men in the Premier Division of the national league; his positions are Power-Forward and occasionally Guard. 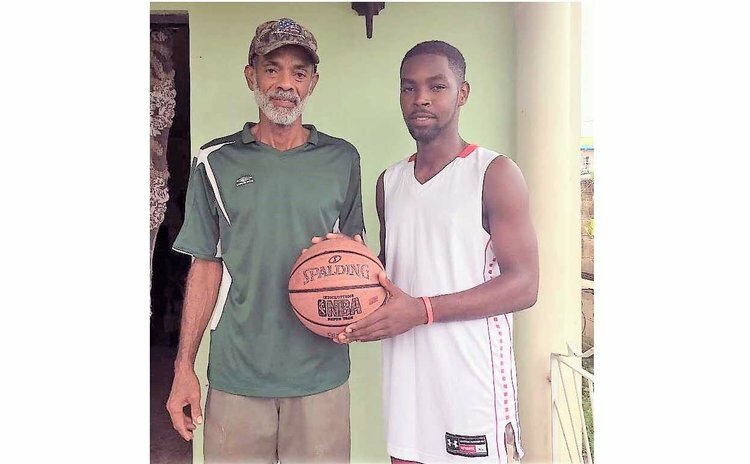 Maxwell, Dr. Rat's 3rd son, first played competitive 'ball with Dominica State College in the Sports Division Under-19 Boys League, and represented Dominica in the basketball segment of the Windward Islands Inter-Schools Games in St. Vincent in 2017. Earlier in the 2017 season he played with Inter-Schools in the National League, and concurrently played with X-Men in the League's second level Men's Division (Division I). Curtis was a founding member of Fond Canie Prowlers in the 1980s, playing in the Intermediate Division of the National League, and helped his team capture the League Championship trophy in their first year. After a couple of seasons the team went through a name change to Fond Canie Rebels and Curtis remained with them for a while thereafter. He also played with that team in the Trafalgar League. Ronnie has played with four teams in the National League thus far. He debuted with Fond Canie Rebels and was later drafted to Knicks, followed by Cardinals in the Premier Division. He subsequently became a founding member of the "Premier Division" Prowlers, with whom he still plays today. He has also represented Dominica on the Senior National Basketball Team. Ronnie also plays with Fond Canie Rebels in Trafalgar's Basketball League. Dyami, Curtis' grandson, was featured in Segment A together with his Dad, Derek Alexander. Oliver, known during his days, afternoons and nights on the court as "Neckers" and "Kaybot", played for only two teams during his basketball career. He entered the National League playing with St. Mary's Academy in Division I, in 1974. The following year he joined Flames Division I, and remained with that team until he retired from basketball at least 15 years later; he was a regular top-scorer. Neckers was a Shooting Guard, and was well known as a sharp-shooter who loved shooting off the backboard and from the corners. He got selected to the National Team while still at school, and during his ten or so years representing Dominica he also served as captain. Burton also captained Flames and served as player-unofficial coach, "calling the subs", time-outs, etc. while running the court. Additionally, he officiated in a few National League games. Neckers represented Dominica in Windward Islands Basketball Tournaments in St. Lucia and Dominica in the mid-1970s; in the 1st OECS Basketball Tournament in Dominica in 1984 and subsequent editions of the Tournament in other OECS territories; and in the CARICOM Basketball Championships in Guyana. Neckers' only son, Sharome, plays with 7Six7 S.C. Young Ballerz in the second level Men's Division (Division I) of the National League. A budding sports-caster at DBS Radio, Sharome has so far commentated on the 2016 National Premier Division League Finals and on the 2017 Schools League Finals.